Explore all of the gorgeous homes below in the luxury Edgewater real estate listings! In the 1800s, this community was once a popular summer destination for the city's elite and remains a top choice for today's affluent buyers. As one of Chicago's oldest communities, Edgewater is filled with exceptional homes that can date back as far as the late 1800s, that have undergone renovations to preserve their dynamic history. With no detail spared, you'll find many popular contemporary elements inside with tributes to the home's remarkable past. Enjoy lakeside living in a beautiful character home that's surrounded by lush urban landscaping. 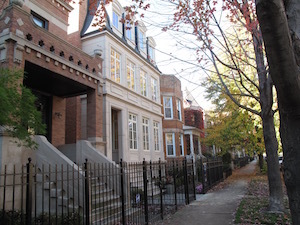 Luxury Edgewater homes for sale are typically found in the Andersonville neighborhoods of the community. Most of the homes in this area are grande single-family homes with a considerable amount of property in the front as well as the back, which often include manicured frontages and a comfortable backyards. What really sets this community apart, however, is the impressive average square-footage of each home, which perfectly completements open-concept floorplans and the multi-room layouts that are classic of traditional homes. From wine cellars to studies, home theaters to sitting rooms and everything in between, these homes truly have it all. Inside the residences you'll commonly find solid hardwood flooring throughout with custom millwork elements like railings along the staircases and shelving in the common areas. Spacious chef-inspired kitchens make food preperation a dream come true with high-end built-in appliances, stone countertops, stylish layouts, and walk-in pantries. From the moment you walk in the door you're immediately greeted with high ceilings with contemporary moulding and built in lighting perfectly set the mood. These well-appointed homes typically include custom bathrooms to mimic a relaxing spa retreat right in the comforts of your own home. This is just a taste of what some of these luxury homes for sale in Edgewater have in store for you. Towards the inner-regions of Edgewater you'll find the historic shopping center of Bryn Mawr, which extends along Bryn Mawr Avenue. While you'll find a myraid of eclectic shops, global cuisine, and historic hotels. Old-fashioned lanterns light the roadways to aid in the delightful infusion of old world charm and modern urban living that can be found here. Continuing down Bryn Mawr Avenue towards the lake is where you'll meet the northern portion of the renowned Lincoln Park. From relaxing on the beaches to enjoying a post-work run along one of the parks many trails or just for a leisurely stroll with your favorite coffee in hand.